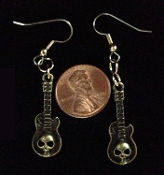 Funky Gothic Punk SKULL ELECTRIC GUITAR EARRINGS - Miniature Pewter Acoustic String Instrument Rock Band Musician Costume Jewelry - Gold-tone Bronze with dimensional SKULL design - mini metal charms, approx. 1-1/4-inch long x 1/2-inch wide. Great for ravers, rockers, bikers!